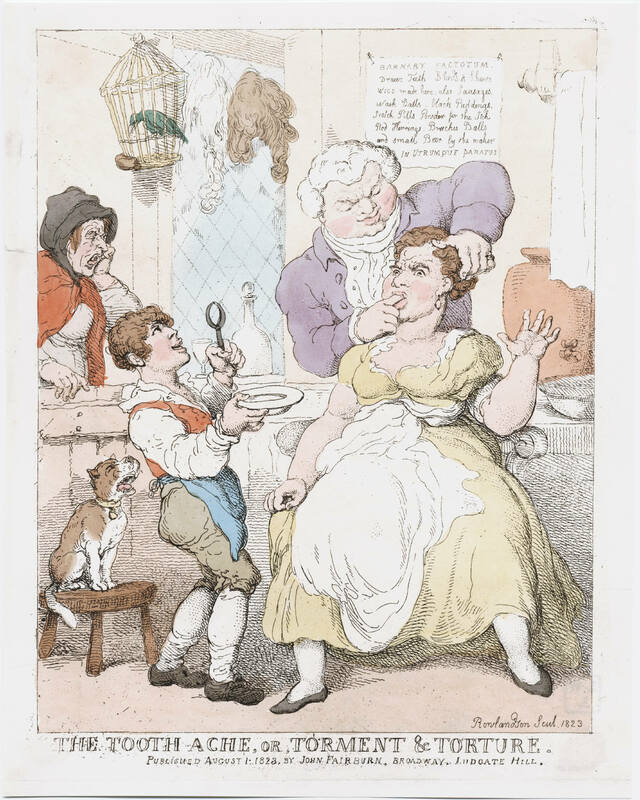 Whilst brushing my teeth the other day I found myself wondering what dental care would have been like in the 18th century, so with that in mind I thought it might form an interesting blog. It’s quite surprising how far we have actually progressed and in other ways how little we have learnt. 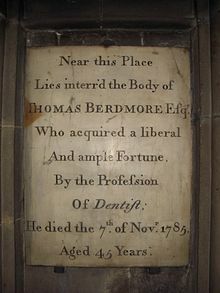 Thomas died 7th November 1785, aged a mere 45 years, in Nottingham and in his will he instructed that his epitaph show his fortune had been acquired “by tooth drawing“, but the family had found that too indelicate so here is the substitute at St Mary’s church, Nottingham. Today we take sugar very much for granted, but we are now very much aware of its harmful effects on the body, less was known of its effects back then and so as it’s usage in the diet increased and with it the risk of tooth decay. Sugar was, however, an expensive commodity, there was of course far more chance of decay if you weren’t working class as sugar was mainly an indulgence of the middle/upper classes. 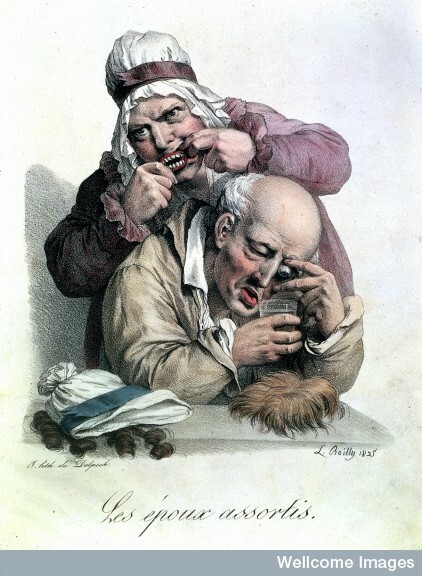 The quantity of sugar consumed in Britain increased fourfold from 1700 to 1800, little wonder people needed dentists! With today’s technology teeth can be repaired or removed even dentures are not essential with implants now being available to replace those dreaded dentures, all procedures being carried out hygienically and with the aid of anaesthetic – ‘you won’t feel a thing’. 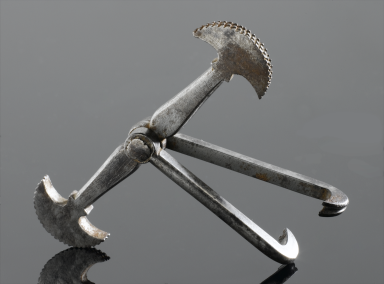 Go back in time to the 1700s and the main solution for a painful tooth was extraction … minus the anaesthetic … ouch! 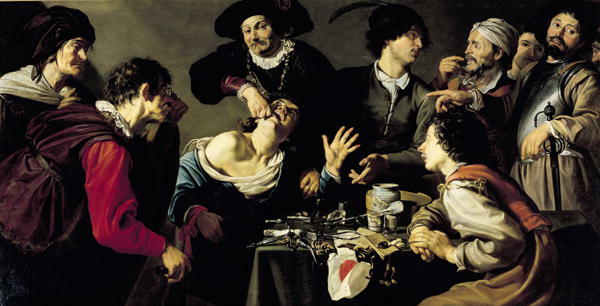 Having your teeth removed really would have been painful as this somewhat earlier painting entitled The Tooth Extractor by Theodor Rombouts demonstrates. 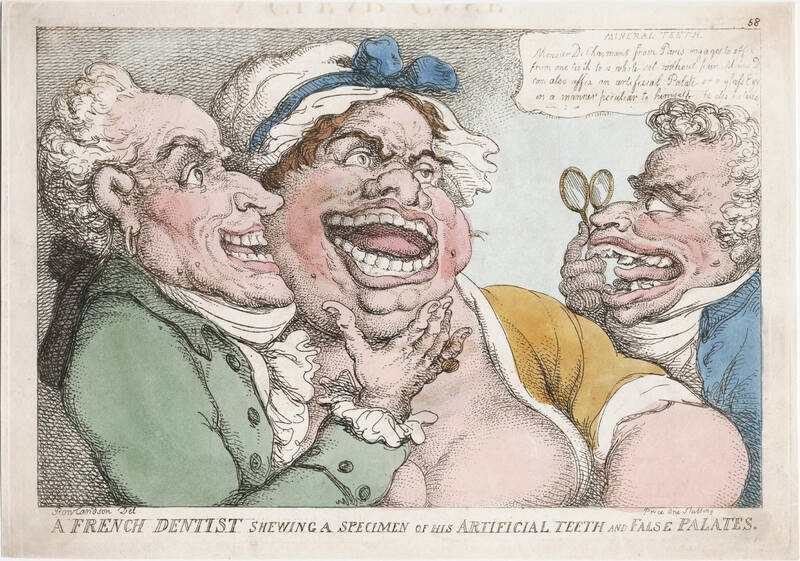 If you were wealthy you could opt for the eighteenth-century equivalent of today’s implants and use a ‘donor’ tooth to replace your removed one in which case the choice was a ‘live’ or a ‘dead’ tooth. The old tooth was removed and the ‘donor’ tooth substituted. Hmm, now the question you would have to ask yourself was ‘do I really want someone else’s tooth in my mouth?’ Let’s be honest you really don’t know what medical conditions that person could have had, so you really could end up getting far more than you had bargained for! But, if that didn’t put you off then you could have your ‘new’ tooth inserted into the empty socket and held in place by silver wire and be returned to your usual glamorous looks quite quickly. Advertisements were placed in newspapers for donors with money being good money being paid for your teeth, so if you were short of money it was always an option! If that option wasn’t up your street or you couldn’t afford it, then the only solutions were to endure the pain, pull the tooth out yourself or have it removed by a dentist/barber. 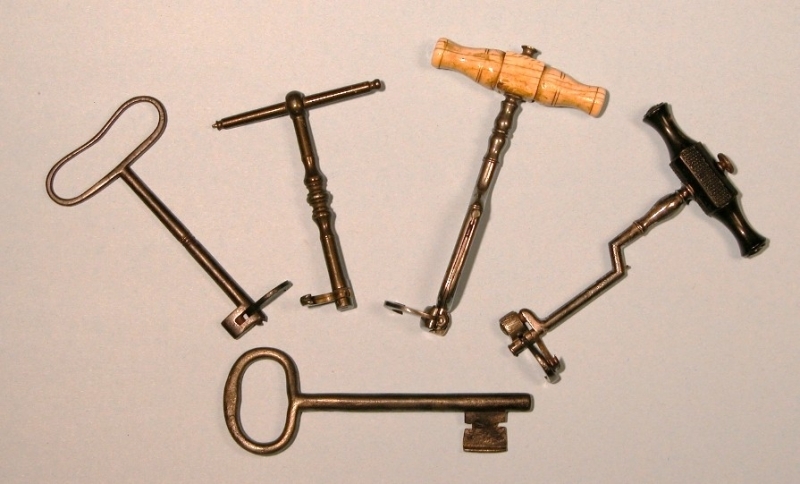 The favoured method of extraction was to use a ‘key’, we’ll save you the excruciating description of how this worked, but, if it failed to work properly the tooth would break and have to be removed piece by piece. 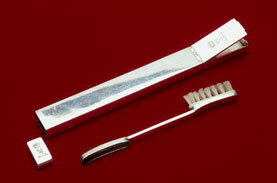 Very much as today dentist had a vast array of implements from pliers to cleaning aids. Dental Pelican for tooth pulling. Courtesy of the Science Museum. If on the other hand, your teeth were in good condition you might simply wish to maintain them, again the dentist could help with this. They could provide ‘mouth water’ which ‘cured all manner of toothache and pain in the gums proceeding from rotten, hollow or stumps of teeth or scurvy and likewise take away all ill smells of the breath. Price 2d and 6d a bottle’; according to the Evening Post, 30th November 1710. Following on from Thomas Berdmore we had Jacob Hemet (baptized 26th January 1729 at St Paul’s, Covent Garden) was also responsible for the teeth of Queen Charlotte, the Prince of Wales and Princess Amelia having been appointed to this post in 1766. As well as being a dentist Hemet was also a salesman and patented his dentifrices and travelled around Europe and America to sell his products – quite the entrepreneur. 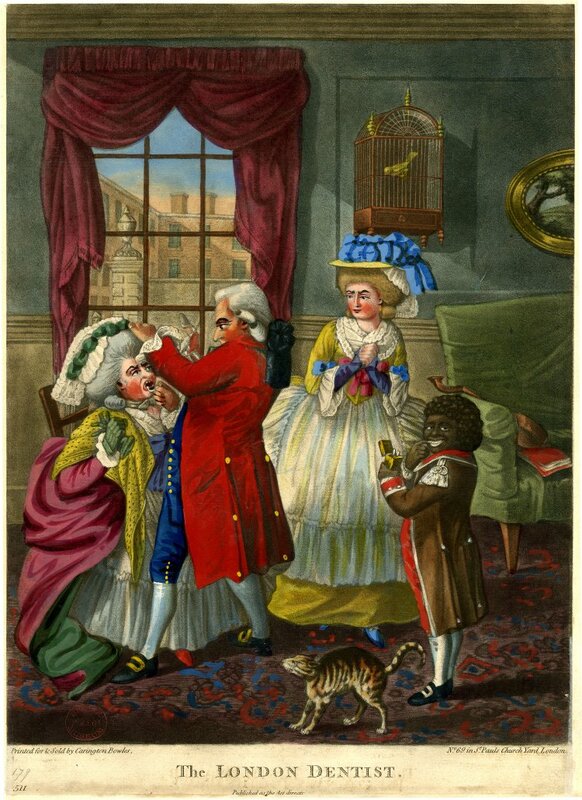 His uncle, Peter Hemet junior, had also been a dentist with royal connections; he was the dentist to the Prince of Wales and to King George II, until his death in 1754, so very much a case of keeping it in the family. See our blog about Mrs Lessingham to learn more about the Hemet family. Pharmaceutical port belonging to Peter Hemet. 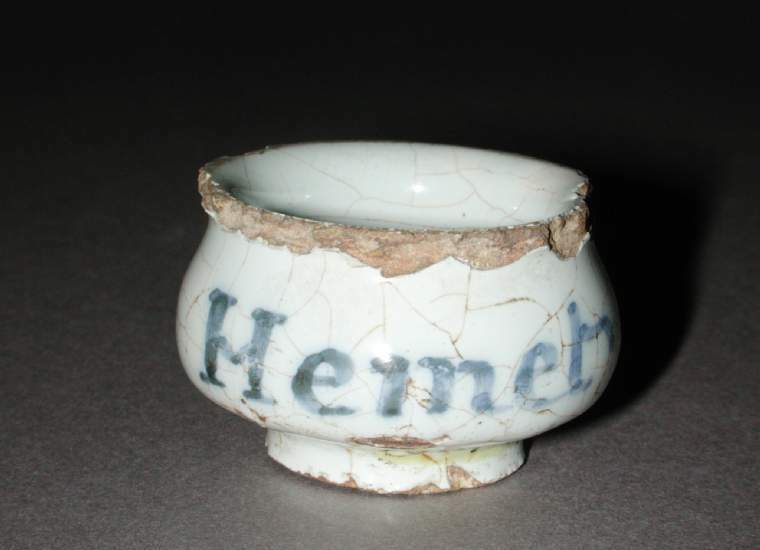 Courtesy of Fitzwilliam Museum. 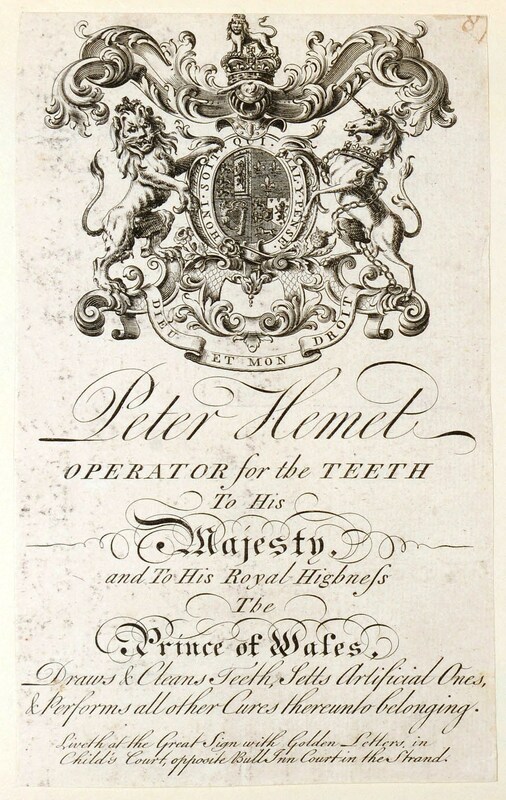 Jacob Hemet, dentist to Her Majesty and Princess Amelia begs leave to recommend to the public his newly discovered Essence of Pearl and Pearl Dentifrice which he has found to be greatly superior, not only in elegance, but also in efficacy to anything hither to made use of for the complaints of teeth and gums; particularly they will preserve the teeth in a perfect sound state even in old age. They render them white and beautiful without in the least impairing. Fasten such as are loose; keep such as are decayed from becoming worse; perfectly cure the scurvy in the gums and make them grow firm and close to the teeth; they will likewise render the breath delicately sweet and remedy almost all those disorders that are the consequence of scorbutic gums. We could not ignore children’s teeth and the London Evening Post of October 28th, 1760 carried an advertisement for an ‘anodyne necklace’ it was a remedy to ‘let out children’s teeth without pain’ i.e. a teething necklace. The reality being that it was a necklace containing henbane roots. 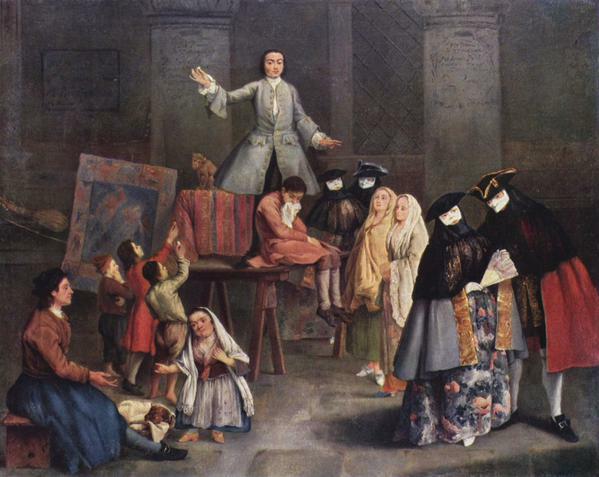 We will leave you with one final snippet of information about dentistry courtesy of Pierre Fauchard, who was regarded as the ‘father of dentistry’ – did you know that Fauchard recommended that human urine be used at the first sign of tooth decay … did it work … we have absolutely no idea, nor do we intend to put it to the test! Of course, as always a blog would not be complete with our usual Lewis Walpole caricatures, so we’ll finish with one. Wonder how many readers will, having read this go and brush their teeth!